Does Inbound Marketing Really Work? A Success Story. The days of lying, cheating, stealing, and bullying consumers into buying a product or service are over. It’s a dying way to do business. Because information is power, and thanks to the internet, the consumers have all the power. The only way to take advantage of this shift is to become truly helpful, which is the cornerstone of the Inbound methodology. The question on everyone's mind when they hear about inbound marketing is, "does this thing really work?" It requires a paradigm shift from traditional marketing/sales tactics. It takes a long-term investment to see the real fruit of your labors. Traditional, outbound marketing methods bring instant gratification, which is still attractive to marketers. At the same time, it’s continually increasing in cost, and decreasing in effectiveness. Yet, we still pay for it! Buying in to Inbound means realigning our focus, from company-first to customer-first. This paradigm shift must take place from the top down, something a lot of companies are still unable to muster the courage to do. But for those who have seen the light, and made the ever-logical decision to shift to Inbound, we’ve found that it works. It just works. Perhaps the greatest benefit for businesses, which I’m fixing to show, is the cost of customer acquisition. 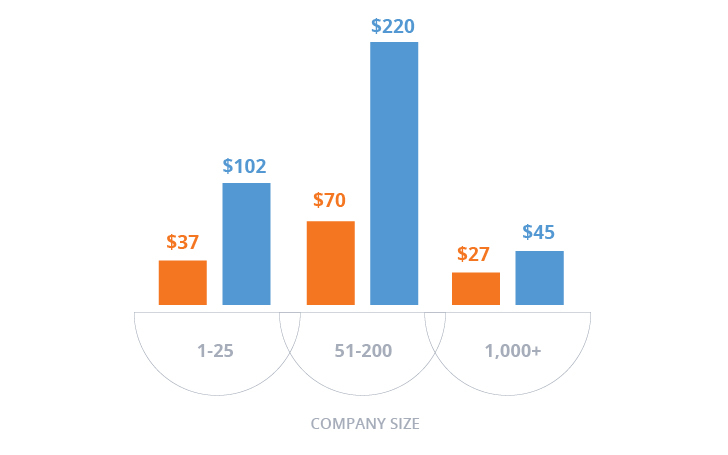 Inbound leads are proven to cost much less than traditional, outbound leads. I was fortunate enough to help a company launch it’s inbound marketing strategy from ground zero. This company decided to adopt HubSpot, and buy in to the Inbound method. After 3 years of stagnated growth, their web traffic was virtually flat lining. Ad spend was their primary driver of both traffic and customer acquisition. Before we get started with this story, it’s important for you to know the landscape. This company was in a highly-competitive market. Their service was local, and the local market was fiercely competitive while the SEO battle was raged globally. Driving organic traffic was going to be a challenge. If any company had a right to say Inbound might not work for them, it was this company. The first objective was to audit past efforts, and see how effectively best-practices had been followed. The result of the audit was pretty bleak. There was a glaring disconnect between content and desired audience. There was absolutely nothing valuable or relevant to the buyers’ journey. 3 years of misguided efforts had led them to this spot. No growth, and a desperate need for an infusion of effective marketing. This is why I believe, if you’re ever going to hire a marketing consultant, it’s important to get them involved early! The bedrock of effective strategies is buyer personas. Had this company had a solid grasp on their target audience, they would have been much more effective in the past. Our first step was to develop their personas, ending with 5 decision makers we could market to. When you’re implementing an inbound strategy, forget about fishing with nets. It doesn’t work! Just dragging a big net, and taking whatever you happen to find inside is for outbound marketers. Angling is the skill for inbound marketing. You have to know where the right kind of fish are hiding, and what kind of bait they’ll respond to. You want to spend your time catching the right kind of fish, not sorting through a net-full of unqualified or irrelevant leads. With target persona’s firmly in hand, we began laying the ground work for our inbound marketing machine. We created some top-of-the-funnel lead generation offers, and setup workflows in HubSpot for nurturing those leads. We understood results wouldn’t happen overnight, so we also built an aggressive PPC advertising campaign to generate leads while our content marketing was getting traction. We’ll talk about this more in a bit. We brainstormed a ton of relevant content ideas, and created an aggressive publishing schedule of 5–6 posts per week, utilizing Marcus Sheridan’s Big 5 content approach. Then, we set to work. Two months passed, with no results. None. And this is where some companies make a huge mistake. After 2 months investment with no noticeable results, many abort the strategy and run back to outbound's ever more expensive instant gratification. This is why I call this the slog. We weren’t very excited with the needle firmly embedded in the same place it had been for 3 months. But we knew inbound worked, so we decided to stay the course. We put our heads back down and continued to produce valuable content for our personas. We’ve discovered that, success with inbound marketing requires total buy in from all stakeholders; from the CEO to the freelance writer. Everyone needs to understand the end goal, and have realistic expectations. There is no inbound marketing lottery where you blog 3 times and hit a jackpot of qualified traffic. It just doesn’t happen. It can, and often does, take months of dedication to begin to reap the benefits. That’s what this company discovered after 4 months of little-to-no results, the 5th month saw the first significant increase in organic traffic. Month 6 saw additional increases, but the PPC budget was also running at an all-time high. With increases slowly starting to show, we decided to scale our PPC budget back slightly going into month 7 with the goal of replacing the lost paid leads with organic ones. We just barely accomplished this goal, but the moral victory made us think bigger. Emboldened by our success in month 7, we made the decision to slash PPC budgets, instead relying on organic traffic to provide leads. It worked, and in month 8, organic traffic increased over 60% while our ad spend was slashed by 70%. We had convinced ourselves that the slow growth for this company was due to heavy competition, but we were only partly right. Sadly, in an embarrassing oversight, I had never done any kind of audit of our link profile. A mistake I’ll never make again. What I didn’t realize was that, 2 years prior to my involvement, this company had hired an SEO company to try and break the flat-line problem. It took an SEO expert to show us that we were actually operating with a Google algorithmic penalty. After hearing this, I ran an audit of our link profile using ahrefs.com. What I found was the ugliest link profile I had ever seen. Their website had virtually 0 quality backlinks, yet hundreds of links coming from super-spammy link networks. We were trying to swim upstream with a giant penguin on our back. All of our SEO was weighted down under the penguin penalty, significantly hindering our progress. Sadly, this is where a lot of companies are living. A few years ago, SEO companies were the fad, and penalties are commonplace. Most companies have no idea how to handle them, and end up paying the same people that caused the problem to fix it. I may be castigated for saying this, but in my opinion, on-site SEO is the only thing you should worry about. Stop paying SEO witch doctors who promise the world and, instead, do the things that help your customers. With this critical information now available to us, we had to spend hours combing through these spam networks, now charging a pretty penny for “link removals.” Such a scam! I didn’t pay a dime. Instead, I lumped them all into a disavow file and uploaded it to Google. Then, I set to work building some quality, natural links through PR and press outreach. I was lucky enough to get quoted in some pretty popular publications and news sites, and the CEO was even able to get on major TV networks. We knew we had the penalty, we had done what it takes to overcome it… yet we were at the mercy of Google’s top-secret update schedule. We would have to wait a few more months for a Penguin update to get out of the cellar. Even with this penalty, the power of inbound was lifting our organic traffic higher and we were able to continue revenue growth while slashing our marketing budgets. Finally, in month 12, we saw another significant increase in organic traffic, to the tune of 30%, and leads continued to build. Of course, this was also the month Google began rolling out it’s Penguin update. Post-penguin, November is off to the fastest start ever, with organic traffic outpacing our current records by 30%. And lead generation, it’s only jumped out to a 168% increase for the first week of November! While I continue to watch the organic traffic trend upward, part of me wonders what kind of results we would be enjoying if the SEO companies had never incurred the Google penalty. The conclusion is, Inbound Marketing works! Even when you have an unknown Penguin penalty, it can have a positive effect on your business. After 3 years of frustration, this company has switched from generating most leads through paid ads, to generating most leads through organic traffic. You will have to experience the slog, even without a penalty. But if you do it well, you will see a significant uptick in all the relevant KPI’s. But you absolutely have to stay the course, which won’t happen if you don’t have 100% buy-in from all stakeholders. It’s tough to wean companies away from the costly instant gratification of expensive outbound habits. But, if you can get through the detox period, you’ll see the long-term success.